Review: This is a difficult book to review. 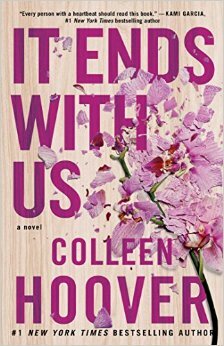 On one hand, it's Colleen Hoover-which means it's a page turner and something you want to finish in one reading session. Her books are rarely straight up romances or love stories, there is some other element that drives an emotional punch. This book was no exception. It deals with an important issue that affects a lot of families and for that, I give her a lot of credit. I wish I could join in the other glowing 5 star reviews (seriously, my entire Goodreads feed is 5 star reviews for this book) but while I found it very "readable" and think it brings visibility to an important issue, there was something lacking. I expect to finish a Colleen Hoover book in tears with a book hangover but I finished this and literally picked up another book almost immediately. I never fully bought into the relationship of Lily and Ryle (side note-has anyone heard this name before?). Everything was extremely rushed. They barely saw each other for the first several months of their relationship as she was building her business (she buys a building for a floral business with no business plan outlined..but of course it becomes a huge success) and he's in his final year of surgical residency. Before we know it they are married. The course they take was sad but not surprising. The strongest part of this book were the journal entries from Lily, which gives insight into her home life as a teenager and her friendship with Altas (another unique name). I found teenage Lily far more developed as a character than adult Lily. Her homelife was tragic and heartbreaking. Overall-not my favorite Hoover book (I love the Hopeless series) but I still liked it.